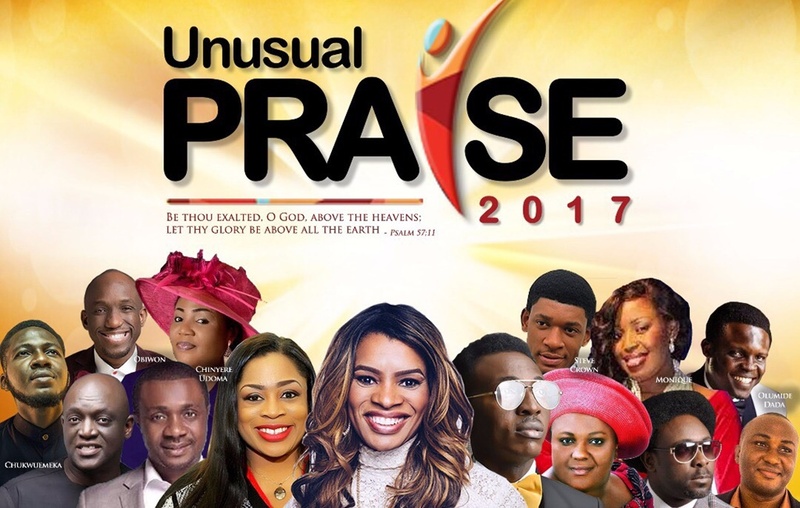 It’s almost time for one of the most anticipated Praise Nights of the year, Unusual Praise 2017! And it promises to be Bigger, Better and more Spiritually filled! 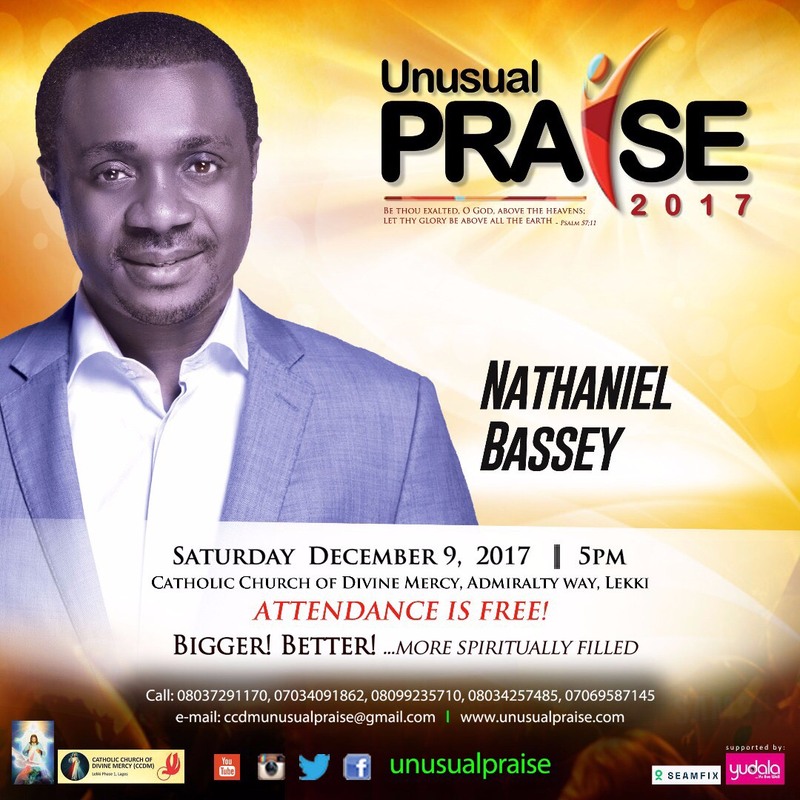 The 7th edition of the Unusual Praise is set to take place on the 9th of December 2017, and this year’s theme is, “Be Thou Exalted O Lord, Above The Heavens. Let Thy Glory Be Above All the Earth’ (Psalm 57 v 11). This event is proudly hosted by the Catholic Church of Divine Mercy, Lekki Phase 1, the biggest of its kind within the Catholic Community in Africa. Please join the Unusual Praise Team and the Anointed Ministers for an Unusual & spiritually uplifting time in God’s presence as they proclaim God’s glory through praise and worship in order to touch lives and win souls for the kingdom. 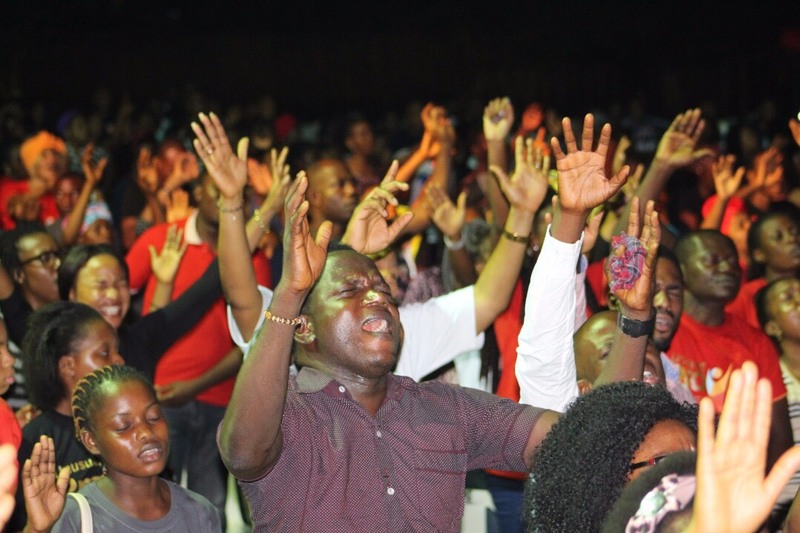 This year’s edition will see powerful gospel ministers like Nicole C Mullen, Nathaniel Bassey, Sinach, Sammie Okposo, Joe Praiz, Chioma Jesus, Obiwon, Chinyere Udoma, Steve Crown, Chukwuemeka, Philip Obonyilo and so many other talented ministers. Praise the Lord with all that is within you, and watch him manifest greatly in your life especially as we prepare for the upcoming year. 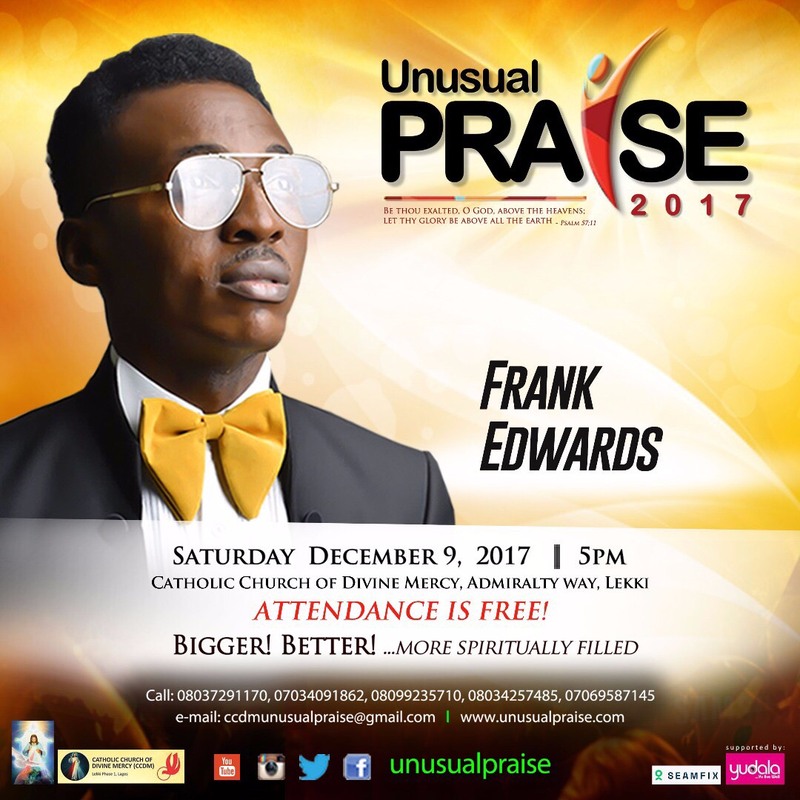 The Unusual Praise ministry is a faith ministry depending on the generous free-will offerings and contributions of all those who will attend the concerts as well as the love and commitment of many volunteers and sponsors. Venue: Atrium Events Center (next to Catholic Church of Divine Mercy, Lekki Phase 1, Lagos. 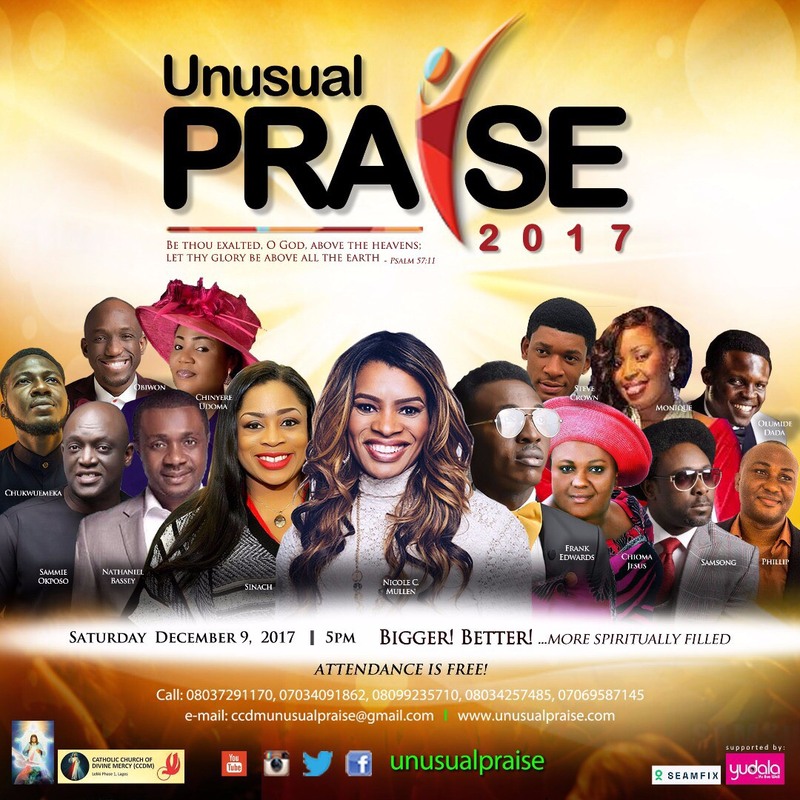 Kamdora is a Media Partner for the unusual praise.